How did he manage to father a child in prison? In all three of the AZ cases, the co-defendant was out on the streets on the day his crime partner was executed. There is the famous Texas case in which Michael Perry and Jason Burkett were convicted of first degree murder. The crime included home invasion and automobile theft, in addition to a triple homicide. Perry got a conviction on one murder charge, Burkette on 3. Perry was executed in 2010. Burkett was convicted of triple homicide & got 40 to life, mainly because his father made a tearful plea at Burkett’s penalty phase. Burkett has since fathered a child in prison and has a big following now urging his release. Burkett is eligible for parole in 2041. Yeah, the arbitrary nature of the DP in the US is a big issue with death penalty opponents, including myself. For goodness sake, if there is going to be a death penalty it should either be applied fairly or not at all, surely? My only problem with the US death penalty is that it isn’t applied equally in some instances. 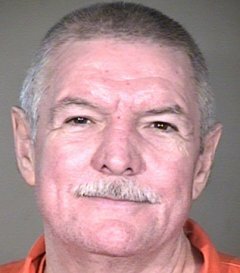 The Arizona Republic reports that Stokley is the 3rd person executed this year in Arizona that has had his co-defendant get a lessor sentence in exchange for a plea and or testimony. This was indeed most unjust. Mr. Brazeal is probably laughing his head off right about now. It reminds me of Paul Bernardo and Karla Faye Tucker. “I am also sorry I was mixed up in those awful events that brought me to this.” There’s no acceptance of responsibility here; he just acts like “those awful events” happened through no fault of his own, like they were a natural disaster or something and he just happened to be there. And “that brought me to this.” Self-pity. How about “that lead to the horrible deaths of two innocent girls”?